Remove the veal from the fridge half an hour before starting to prepare it. Place the veal schnitzels next to each other in the freezer bags and use a heavy pan or similar to flatten them. Spread the mustard onto the veal schnitzels and sprinkle with some freshly ground pepper. Wash and dry the flat-leaved parsley and mint. Remove four nice mint leaves and set aside to use as a garnish. Chop the rest of the mint and the parsley finely and distribute evenly over the veal schnitzels. Roll the veal schnitzels up and fasten with the cocktail sticks. Place a suitable non-stick frying pan on a medium heat. Add the olive oil and fry the veal schnitzels on all sides until browned. Add the white wine or grape juice, cover the pan and leave to braise for 10 minutes. In the meantime, wash and dry the grapes and cut them in half. Cut the lime in half. Cut one of the halves into segments for the garnish and squeeze the other half. Mix the grapes and walnuts through the butter. Add the sugar and lime juice and heat the mixture gently until the liquid has almost evaporated and the mixture begins to caramelise. Remove the rolled veal from the pan and wrap in tinfoil. Put the pan containing the meat juices back on the heat. Stir the potato starch into the water. Add it to the meat juices in the pan, stirring continuously and heat the stock briefly. Put equal portions of the grape and walnut mixtures onto four plates, cut the rolled veal cutlets diagonally and place on the plates. 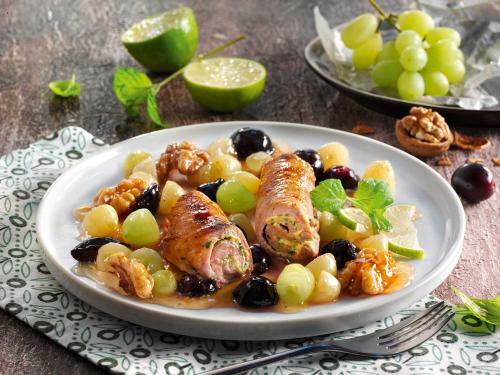 Drizzle the gravy over the veal and garnish with the lime segments and mint leaves. Serve immediately.